Um, the internet of what? 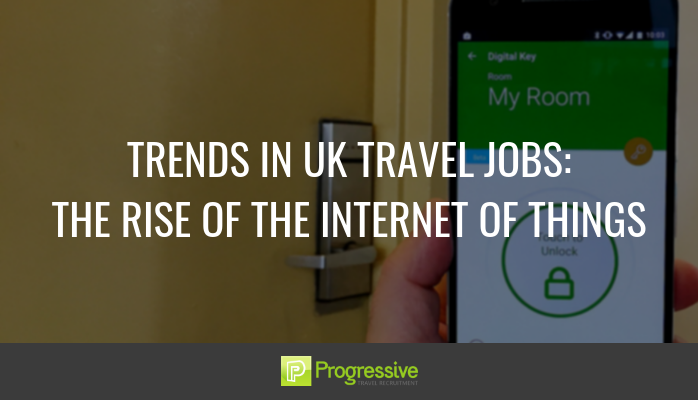 What is IoT or the internet of things and how does it impact me and UK travel jobs? The internet of things is the network of devices that are connected and communicating. For example, your phone feeding your GPS coordinates while allowing you to control your heating and appliances at home and view anyone at your door: always connected. With over 20 billion devices connected you can’t ignore the fact that IoT will soon be the norm. Airlines are now starting to use connected smart devices to improve the passenger experience in areas from baggage handling to monitoring safety and the efficiency of their service. Airline tech workers are looking into innovations that enable faster baggage collection and easier check-in services based on your location settings. Travel Apps are being developed to offer travel safety advice based on where you are travelling to or where your location says you are. And efficiency of service is improving with texts that might say: ‘I can see you’re at the airport. Your terminal is A and it will take you 12 minutes to walk there.’ Or, perhaps if you’re hoping to get a connecting flight, an App can tell you in real time whether you’re going to make it or not. The hotel industry isn’t far behind, either, as it works to let you have more control over your experience. You can operate lighting, heating, and music using your smart phone, connected to the hotel Wi-Fi. And your phone can even become your room key or give you access to a hotel gym in some places. It also allows you to learn about activities and receive reminders so that you never miss a transfer or dive excursion again. And when a traveller is out and about, sensors can alert them to the nearest bus stop or event when it senses they’re nearby. While the technology and usage are clearly growing all the time, it still remains to be seen is how fully these developments are embraced by us, the public. Concerns include worries about ethics and permissions, data storage and of course data use – something we’re all increasingly aware of. How well the internet of things continues to expand largely depends on how much we embrace the technology and how well it can simplify our travel experiences. What is certain is that we are in a world where people are constantly demanding more. More for their time and money; an improved service, with time-saving and cost-cutting when and where it matters most. With the global and UK travel industry striding ahead with the internet of things it will be interesting to keep a close eye on how this travel trend develops over time. Key to being ahead of this trend is having the right people to manage your technology process. The right developers, engineers, managers and testers. It’s a fast-growing sector in UK travel jobs, and Progressive Travel Recruitment is at the forefront of IT and technology recruitment in the travel industry, with a dedicated travel IT recruitment division. Don’t wait. Get in touch with Rosie Dunbar (+44 (0) 7940 511 932) at Progressive Travel Recruitment for specialist help with your travel specific IT and Technology recruitment needs. Be at the forefront of the Internet of Things revolution in travel. Connect with Rosie on LinkedIn here.